Please review our Privacy Notice that governs your visit to our website and to understand our practices. What Personal Information about Customers Does CSI Creative Sport Innovations Inc. gathers? The information we learn from customers helps us personalize and continually improve your shopping experience at CSI Creative Sports Innovations Inc. In the 50 U.S. States, Canada, and/or the world CSI Creative Sports Innovations Inc. is not responsible or liable for any injury and or mishap of any kind to a person or persons that use the Dugout Manager outside of its intended or as its recommended use. 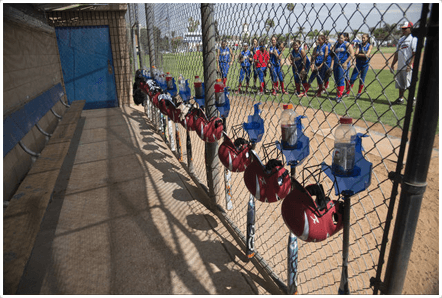 This policy includes but is not limited to the installing and removing of the Dugout Manager on or from a fence/dugout or testing beyond its recommended use. CSI Creative Sports Innovations Inc. reserves the right to determine whether the damage to the product is due to failure to use the Dugout Manger as recommended..
CSI Creative Sports Innovations Inc. is concerned with keeping the information you submit to us secure and private. We want to provide you with a fast and easy purchase process. We can accept credit card payments and provide you with the safety and comfort you demand when ordering on the Internet. CSI Creative Sports Innovations Inc. offers you the advantage of placing your order online using secure servers and encryption. Your purchases, credit card information, and personal data are encrypted and secured through a link to our commerce server. During the completion of your order, you will be linked from our web pages to customized screens on our secure server. Your information is encrypted during its trip across the Internet to prohibit viewing by a third party. CSI Creative Sports Innovations Inc. and its associates attempt to be as accurate as possible. However, CSI Creative Sports Innovations Inc. does not warrant that product descriptions or other content of this site is accurate, complete, reliable, current, or error-free. If a product offered by CSI Creative Sports Innovations Inc. itself is not as described, your sole remedy is to return it in unused condition. Please review our other policies, such as our Shipping and Returns policy in our shopping cart. These policies also govern your visit to CSI Creative Sport Innovations Inc.. We reserve the right to make changes to our site, policies, and these Conditions of Use at any time. If any of these conditions shall be deemed invalid, void, or for any reason unenforceable, that condition shall be deemed several and shall not affect the validity and enforceability of any remaining condition.